UC: Boldly Californian for 150 years | Link: UCOP's e-newsletter | Stay Informed. Stay Connected. 2018 marks the 150th anniversary of the University of California, offering us all the opportunity to reflect on the impact UC has had on the state of California and beyond. Since its inception, UC has helped to shape the progress of not just our state but our society. From the bold decree to admit women 50 years before they were granted the right to vote, to the successful completion of the first open heart surgery in the western United States, UC has consistently broken through barriers and blazed new trails for scientific discovery, economic expansion and social change. We will be celebrating UC’s sesquicentennial in a number of ways in 2018, including a special recognition on the university’s original Charter Day, March 23. Stay tuned to Link for news of special events at UCOP! A new digital UC timeline captures our rich history and celebrates many of UC’s astounding acomplishments, and distinguished academics, artists and athletes. Explore the interactive, multimedia timeline to learn more about the university’s role in pivotal moments like World War II, the Free Speech Movement and the birth of the biotech industry. In 2018, we will celebrate not only our past accomplishments, but the fact that every day our incredible students, faculty and staff create new milestones. Today, UC enrolls 273,000 students across ten campuses, conducts one-tenth of all academic research in the nation, and oversees five top-ranked medical centers that provide care to more than 4.5 million people a year. Not bad for an institution that started out with just 40 students and ten faculty members! We call ourselves “Boldly Californian” because the university shares the same strengths — vision, innovation and optimism – as the Golden State it serves. Our mission of education, research and public service plays an essential role in powering the world’s sixth largest economy. We contribute to the greater good of not just the state but the nation by continually improving access and affordability to the greatest public university system in the world. And as President Napolitano indicated, we’re not resting on our laurels, but moving boldly forward into the future. 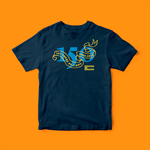 Download a special 150th logo for your email signature line here. Once the PNG image file is on your computer, open your signature preferences in Outlook and drag/insert the PNG into your signature line. Copy images you like from the UC timeline and share them on your favorite social media sites along with the hashtag #UC150. Accessing the special 150th logo for email signature line requires UCOP login. How are staff on the campuses able to get it?